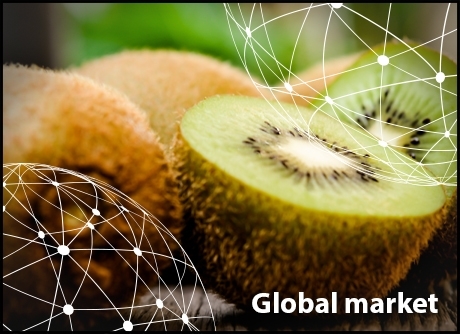 All eyes in the kiwifruit sector are now on the southern hemisphere, which is now slowly taking over the world market. The first New Zealand kiwis are already at sea. European and North American traders look back on a predominantly positive season, with Italy as a major exception. The kiwifruit sector has had a difficult month there. The French sector also suffered a blow last month, when it turned out that some of the kiwis sold as French were actually Italian. The Zespri SunGold season has started early. The first shiploads left for China and Japan a week ago. It is the beginning of what seems to be a big harvest. Zespri expects to export more than 600,000 pallets to overseas destinations this year. The company says it shipped 76 million green kiwifruit trays and 65 million SunGold trays last year. According to the latest estimates, Zespri will supply more than 75 million SunGold trays this year. For green kiwifruit, the figure is expected to stand below the 75 million trays. Most production areas have had a dry summer. Zespri hopes that this will turn out positively and result in fruit with a good taste. Statistics from Hort Innovation show that 9,582 tons of Australian kiwifruit were grown in the 2017-2018 season. This entailed a 2% drop compared to the previous year. Still, the total value went up by a whopping 28%, reaching a total of $ 26.3 million. The domestic season has just kicked off and will peak in the fall. Last year, exports increased by 9% in terms of value and by 20% in terms of volume. Most exports are intended for the German market (49%). At the same time, Australia imported 21,772 tonnes, mostly from New Zealand. In Germany, the kiwifruit season is currently satisfactory. The prices have remained stable for several months, as have the available volumes from Southern Europe. "The last Zespri kiwis from New Zealand were already traded in mid-December. After that, the market switched seamlessly to French kiwifruit. As long as Zespri is on the market, other brands and origins are hardly to be found, even if the quality is good," says a wholesaler. The first arrivals of Seeka kiwis from Australia are also expected in the German market at the end of April / beginning of May. Traders say that kiwifruit is mainly a by-product on the wholesale markets. It is mainly offered in three calibres (20, 25 and 27), whereby caliber 20 is usually slightly more expensive. Lastly, it is also worth noting that the supply and market situation have remained virtually unchanged throughout the year. The first New Zealand kiwis are already en route to Zeebrugge. The first boat is expected to arrive at the end of April / beginning of May. The volume harvested is greater than last year's. There is a lot of SunGold coming to Belgium this season, but also more green kiwifruit. In recent months, the Belgian market has felt the shortage of French kiwifruit. The prices of French kiwis have reached record high levels in recent times, but this has had little or no influence on sales. Despite the shortage, traders are convinced that they will be able to deliver fruit until the start of the New Zealand season. At the end of March, the French market was startled by the disclosure that 12% of French kiwis sold in France over the last three years were actually Italian. The total figure amounts to around 15,000 tons. The fraud came to light because there were still many French kiwis on the market while the season was already coming to an end. Both growers and consumers were shocked by the news. France grows 45,000 tons annually, while the Italians have an annual yield of 400,000 tons. Consumers pay around € 0.70 per piece for French kiwis, while Italian kiwis are sold for € 0.50 per piece. The illegally earned money amounts to € 6 million. Also worth noting is that fact that a crop protection product was detected on the Italian kiwis that were sold as French which is not permitted in France. Apart from 'kiwigate', the sector has had a good season. Both the prices and the quality have been satisfactory. Growers currently have less than half of their stocks left. The last French kiwis are usually marketed around May and the harvest from the southern hemisphere is gradually taking over the market. March was a bad month for the kiwifruit sector. Normally, the prices go up then, but that did not happen this year. Growers hope that the market will pick up again this month. The quality of the kiwifruit is good and the shelf life is, in fact, excellent. The quality of the kiwis from Latina and Calabria is particularly high, although there are always differences per individual grower. For some time, the supermarkets have been demanding kiwis that are ripe enough for consumption. A number of years ago, many hard kiwis were put on the market and that led to dissatisfied customers. Now the fruit that is on the shelves is as good as ready to eat. After 4 or 5 months in the cold store, the fruit's quality is still good. There are many reasons for the difficult situation on the Italian kiwifruit market. Firstly, the Greek green kiwifruit is putting a lot of pressure on the European market, as the season overlaps with that of the Italian kiwifruit. The Greek techniques to extend the fruit's shelf life are a lot better than three to four years ago. Greece exported less up until February. Secondly, there is pressure from other cheap European fruits, such as apples from all over Europe and pears from the Benelux. Furthermore, the economic situation does not stimulate consumption (this even applies to the domestic market). Also, the popularity of yellow kiwifruit is increasing at the expense of green kiwifruit. The yellow kiwi was still fully available on the market until mid-March. On March 31, the Italian Hayward kiwifruit stocks were 16-17% greater than on the same date in 2018. Yet, the total volume is still 20% lower than the average of recent years. The demand should grow in the pre-Easter period, especially on the Italian market. Currently, the prices for larger kiwis amount to around € 0.50 - € 0.60 per kilo. This is lower than in the same period of 2018, and even € 0.30 - € 0.40 lower than in 2017. The Spanish season is coming to an end this month. A grower and exporter from Galicia says that the harvest was plentiful this year, with a good balance between small and larger sizes. This ensured reasonable and stable prices. The prices for small sizes are higher than a few years ago. This is due to an increasing demand from retailers, which want to sell small packages. African countries also demand small sizes due to the lower price. The local market is important for Spanish kiwifruit. The domestic market may even have the potential to consume all Spanish kiwis, because nowhere in Europe do people eat as many kiwis per inhabitant as in Spain. Nevertheless, it is difficult for Spanish growers to compete with the low prices of kiwis from Greece, Italy and New Zealand. The season started in September in the region of Valencia, where not a lot is grown. At the end of November, the season kicked off in Galicia and Asturias, the largest Spanish growing areas. The acreage remains largely stable and shows a slight growth. There are still Chinese kiwis on the market. These now come from the cold stores. For the somewhat smaller plantations, the season comes to a close in April, but the larger ones still have enough supply until August. In 2018, the production volume fell in some growing areas. This was due to the severe frost recorded in the spring of 2018, just during the flowering. The weather is currently good, so the current flowering period is going well. Since the beginning of January, quite a few imported kiwis have also come on the market. The most important import countries are Greece, Chile, Italy, Australia and New Zealand. The New Zealand season has just started. Zespri kiwis are on their way to China and will probably arrive in early April. Zespri is a very popular kiwifruit brand in China and the SunGold has gained a lot of popularity in recent years. California is closing a good kiwifruit season. The season started on October 1 with a big harvest, and there was a lot of export. The domestic season overlapped with the Italian import season. An importer says that there was a continuous supply from Italy. "I think they had a big harvest in Italy, because the season is still going on." The importer will soon make the switch to the production from Chile and New Zealand. “Chile and New Zealand are just starting. The Chileans deliver better quality and try not to pick any unripe fruit. I have also heard that a large yellow kiwifruit harvest is coming from New Zealand, so I expect large volumes on the North American market in the coming season. ”The good supply coincides with a rising demand. American supermarkets have more kiwis than before on the shelves and are making a good profit from them." The prices have been slightly lower than normal due to the great supply, although they increased again with the end of the domestic season. "The prices have remained fairly stable, until they rose in week four due to the reduction of the supply."